This is the sweetest of the sweet fruits available in Thailand. Originally from Southern China, this Dragon Eye fruit (as the Chinese called them) are widely cultivated across Thailand, but the Northern Provinces seem to be the center for the farmers that cultivate longan. There are factories to process this fruit and export to China and Taiwan – most of them dry the fruit and sell them later. When they are ripe, Longan could be eaten raw or added into Thai sweets. The dried ones could be used for making tea or added in the stew with chicken. Apart from sugar Longan contains some vitamin C , calcium, phosphorus and Iron. It is good for increasing appetite, and helpful in relaxing. 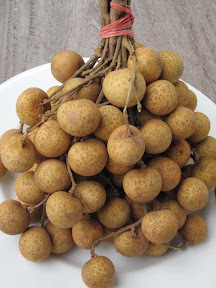 Longan will make the body hot, so Thai people will eat Mangosteen after longan because mangosteen has cooling effect.